I have shared foundation collections, lipsticks and blushers so it is about time I shared some of my favourite nail varnishes. The photo above pictures only a sample of my collection and though I would love to review them all, we would be here all day. I have whittled them down to my top 10 most worn. 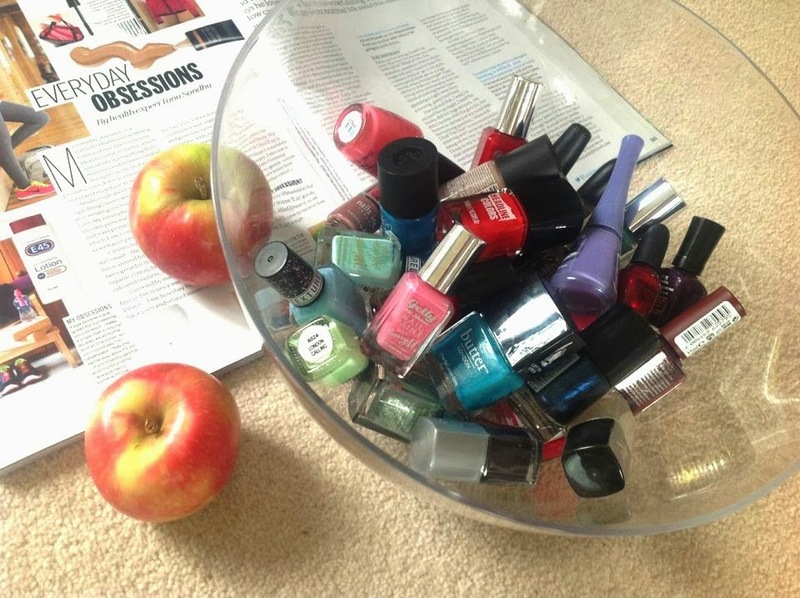 I also have a collection of Sensationail gel colours but I haven't included them in todays post. 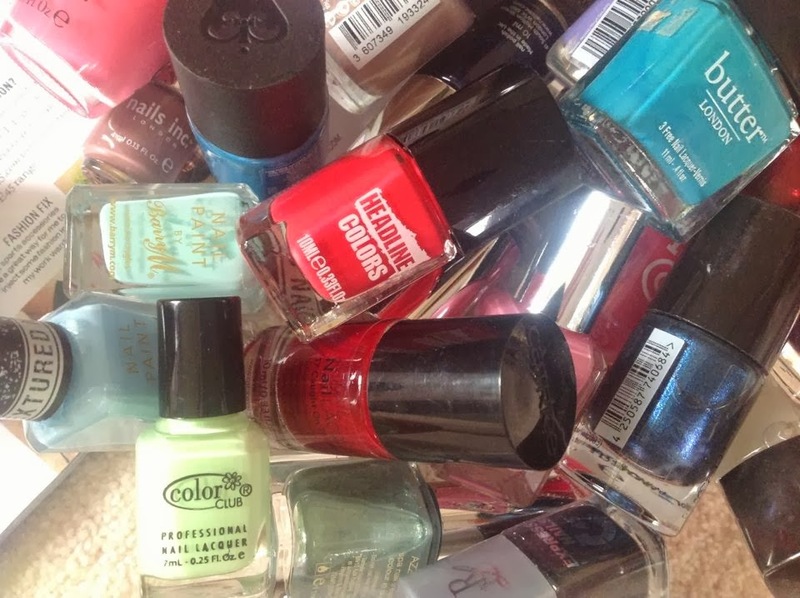 When it comes to buying nail varnish, I am a big fan of high street brands, reason being - you can buy more for your money! I'm greedy, I know. I do sometimes splurge out on a more expensive brand but not very often. I tend to spend more on the Gel colours as they give you longer lasting manicures. 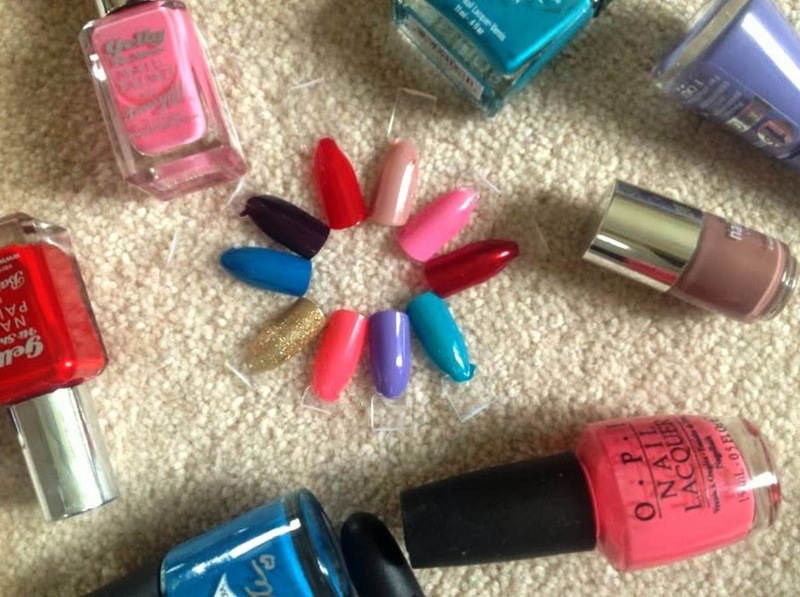 With that here are my top 10 most worn high street nail varnishes. This is my absolute favourite nail varnish by Butter London. This rich turquoise really makes a statement when worn and it is the kind of shade that you can wear any time of day, month or year. The only thing I am not totally keen on is the name, but the Butter London nail varnishes all have quirky stand out names. Bourjois nail varnishes are great and I particularly love the 1 Seconde salon finish range with their gel like silicon texture. This varnish feels very luxurious. The brush has a wide fan effect tip which helps the application process run more smoothly and the consistency is so thick you only need 1 coat. It also dries extremely quickly. This lavender shade is so pretty I wear it at least once a week. Before departing on my holiday to Ibiza earlier on in the year, I was browsing in duty free when I realised I had not packed any nail varnish and my nails were in a serious state of disrepair (any excuse, I know). I wandered over to the O.P.I stand and spent ages looking at the various shades. I chose this particular one because the name stood out to me - 'ElePhantastic Pink!' I love Elephants and I love pink , problem solved. This is quite a bright pink, definitely more neon than baby. Very pretty, only problem being you do need more than 1 coat to get the full benefit, don't let you put this off if you are in a hurry - simply buy the O.P.I drying drops! Unfortunately this one doesn't have a number or name but it is an obvious gold with glitter through it. I received this in a makeup swap (along with another I will be talking about) and on first impression I thought this was a top coat, I was wrong, this has a thick enough consistency to be worn on its own. I don't normally wear this one during the day, but definitely reach for it on most nights out. The Salon Pro range by Kate Moss are so so similar to the Bourjois Paris 1 Seconde. The consistencies are similar and so are the fan like brushes. Brit Pop is another gorgeous Turquoise but slightly darker than the Butter London 'Slapper'. You will have to forgive me, I can't remember where I got this, it was either in a beauty swap or a beauty box. This mini Wet n Wild mega last nail colour, does exactly what it says on the label. Disturbia, is an extremely deep purple. I am a huge, huge fan of red lips and nails. I think it is becoming my signature style. I love the Barry M Gelly range. They make your nails look shiny and feel really smooth. Blood Orange is a really rich red (not orange) and I can't get enough of this shade. I love the nails inc. brand and a while ago I picked up Jermyn Street - it came free in Cosmo I think, if not Cosmo then one of the other leading magazines. I'd describe Jermyn Street as a soft taupe, but if you think I am wrong, do put me right as I am absolutely terrible at 1. describing scents and 2. describing colours. My second favourite Barry M Gelly nail colour is this adorable baby pink, it is one of those must have nail colours. Though the name 'Dragon' confuses me a bit, I'd say it looks like it should be called something softer like 'Unicorn' rather than 'Dragon' (see how my mind works?). Lastly, we have the second Sephora by O.P.I in my collection, this time it is a mini varnish in a deep Burgandy shade and I absolutely adore it. It has the tiniest glimmer of shimmer throughout and is another of my favourite go to evening shades. Which was your favourite? I hope you enjoyed this post and excuse any rambling! 2 sleeps till the weekend! All great picks and love your photography!! In love with the colour of that OPI nail varnish... definitely going to have to buy!! Makes picking one to wear really difficult lol. Oh very colorful and cute nail polish! Thought you may like to know that the full name for Dragon is Dragon Fruit. I guess the full name wouldn't fit on the bottle label though! All the Barry M Gellys are named after fruits. oooh lovely selection! I am hooked on the barrym Gelly Hi-shine Nail Paints! I just love them so much! !